Custom Ankle Socks - a great unique promotional item for marathons, walkathons, or just for fun! Affordable quality. We love wearing socks on a rock, we love wearing them while walking to the dock. We even like wearing them while watching the clock…okay that last one was a stretch. 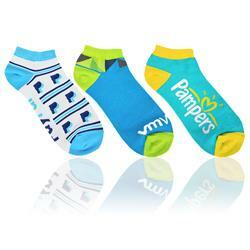 Base Price Includes: Standard sized Pantone matched socks with knit-in design and bulk packaging. Pantone may not be exact due to material. We can basically construct this to your needs - so many optional methods. Other packaging options available including hang tags. 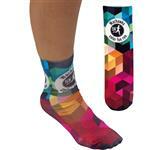 You will love these customized socks! 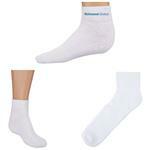 Ankle Sock comes in two sizes; standard and petite.